This post began with some musings at Wagner James "Hamlet" Au's blog, New World Notes. Au has also covered the utopians and skeptics of virtual reality in a piece at Wired, "VR Will Make Life Better--Or Just Be an Opiate For the Masses." Some proponents of the Occulus Rift 3D viewer are claiming that a virtual world good enough is as good at the life we lead without goggles and a fast internet connection. Since this issue involves both of my blogs, I hope readers will excuse the cross-postings. 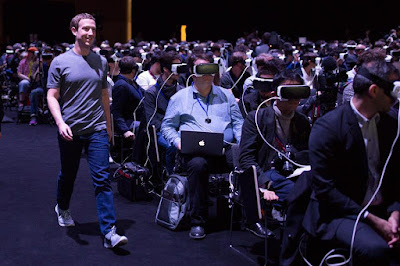 I have also been thinking about how Mark Zuckerberg of Facebook is very much invested in Occulus tech and why the picture of him, striding among a crowd wearing Rifts, chills me to the bone. Here was my reply at New World Notes. Even a happy virtual life would neglect the agons of a happy real one. Yesterday I labored a few hours on a farm tractor I'm selling, checking for issues and eliminating possibilities in the electric system. I used a lot of stored knowledge in the wetware of my brain to trouble-shoot. I was in a place without reliable wireless, so double-checking hunches with the phone was not possible. Then I went to work on the fuel system, turning wrenches and skinning knuckles until I had the likely culprit. At night I went online, into a flat virtual community, to check my assumptions. This weekend I'll clean out the fuel tank, blow compressed air through all the fittings, and restart the old diesel. 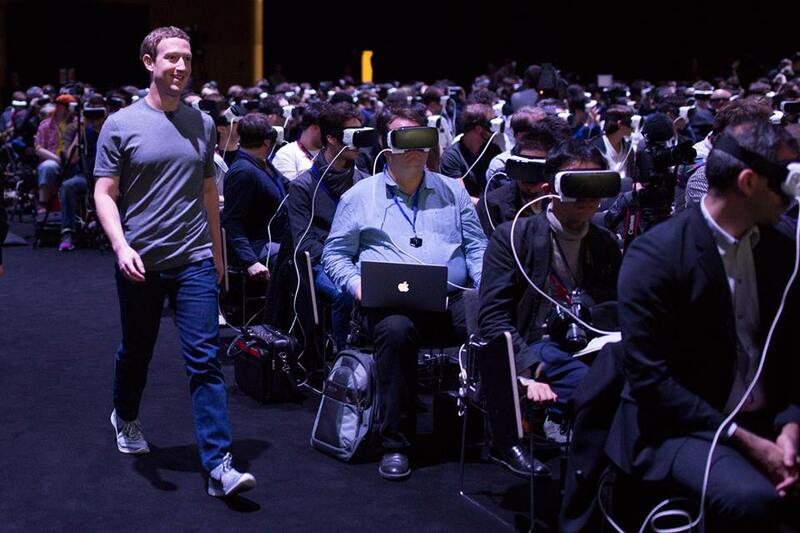 Simulating all that with an Occulus might eventually be possible. Doing so might even feed me if my virtual farm supplied RL income. But you know what? Virtual is still FAKE. Always will be until someone really does achieve the Singularity. Hence my consideration of SL and more advanced forms of virtual worlds as just something nice for entertainment, like a novel or film but more immersive. "I know this: if life is illusion, then I am no less an illusion, and being thus, the illusion is real to me. I live, I burn with life, I love, I slay, and am content."